Secret Tunnels of Chinatown, cont. Secret tunnels in Chinatown included the one emanating from the present-day Cameron House at 920 Sacramento Street (left photo). In the 19th and early 20th centuries, neither Chinese American leaders nor white officials in San Francisco made any real effort to curb the tide of a growing slave trade. With few legal resources, a Protestant missionary by the name of Donaldina Cameron (upper right photo) extricated upwards of three thousand girls from serfdom. They were known as mui tsai and sold into prostitution or domestic work by the tongs who ran the brothels. The rescue work was dangerous as Miss Cameron received ongoing death threats from the gangs. Bold beyond description, she would chase down leads to free the women. On one occasion, the missionary shared a slave girl’s cell in order to save her. While Miss Cameron had the assistance of the Chinatown Squad, other officers from downtown accepted bribes to aid the tongs. 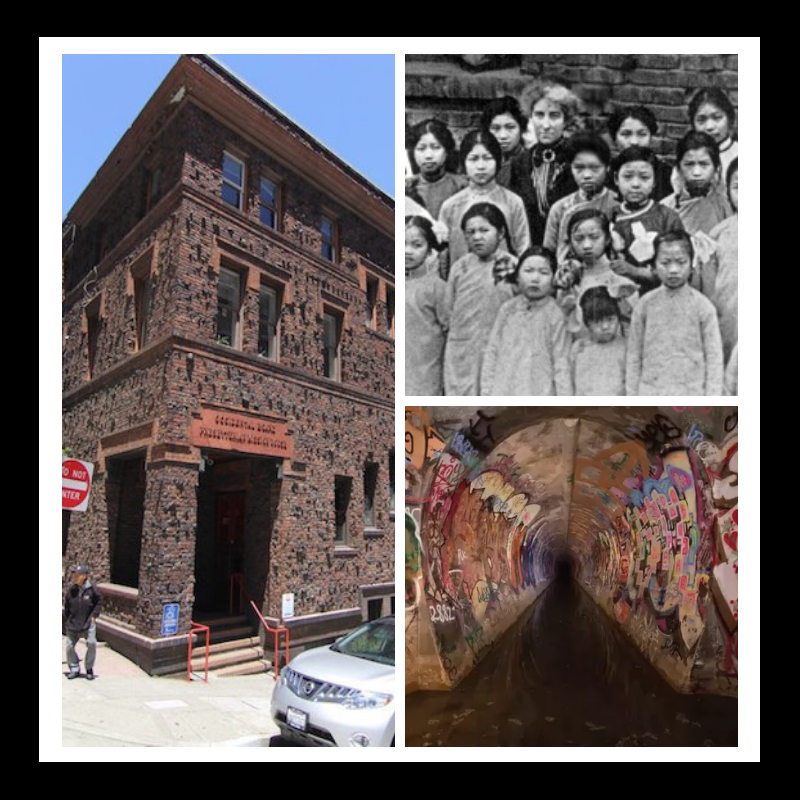 When tong owners came with search warrants to the brick building on Sacramento, the girls would scurry down to the basement where they would escape through a secret tunnel that led to a maze of sewers (lower right photo). Donaldina Cameron died in 1968. 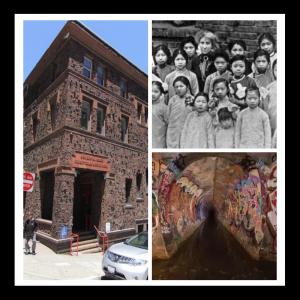 Today, the Cameron House still serves the city’s Asian American community, offering a range of social services and popular youth programs. Access to the secret tunnel has been bricked off but remains well-marked for visitors to remind them of a past once teeming with abuse.